I’ve been reading about the Bounded Degree Spanning Tree problem and I thought of writing some of what I am learning here. It illustrates a beautiful techique called Iterated Rounding and uses the combinatorial idea of uncrossing. I’ll try to give a high-level idea of the argument and give references on the details. The first result of this kind was given by Goemans (although there were previous results with weaker guarantees) by Goemans in Minimum Bounded Degree Spanning Trees, but the result based on iterated rounding and a subsequent improvement are due to Singh and Lau in a serie of papers. A main reference is Approximating minimum bounded degree spanning trees to within one of optimal. The problem of bounded degree spanning tree is as follows: consider a graph with edge weights and we for some nodes a degree bound . We want to find, among the spanning trees for which the degree of is the one with minimum cost. It is clearly a hard problem, since taking all weights equal to and for all nodes is the Hamiltonian Path problem, which is NP-complete. We will get a different kind of approximation. Let OPT be the optimal solution: we will show an algorithm that gives a spanning tree of cost such that each node has degree (this can be improved to with a more sofisticated algorithm, also based on Iterated Rounding). 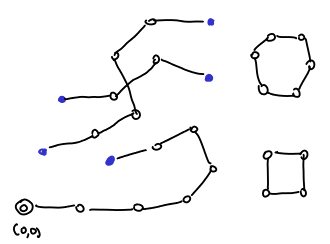 The first constraint expresses that in a spanning tree, there are at most edges, the second prevent the formation of cycles and the third guarantees the degree bounds. For we have the standard Minimal Spanning Tree problem and for this problem the polytope is integral. With the degree bounds, we lose this nice property. We can solve this LP using the Ellipsoid Method. The separation oracle for the is done by a flow computation. Lemma 1 For any basic solution of the LP, either there is with just one incident edge in the support or there is one such that that at most edges are incident to it. If there is one node with just one edge incident to it in the support, we add it to the tree, remove from , decrease , make (the trick is to remove in each iteration edges from that are not in the support. Clearly, removing those edges doesn’t hurt the objective value) and run the algorithm again. Notice that the LP called in the recursion has value less or equal then the actual LP . So if by induction we get a spanning tree respecting the new degree bounds plus two and value less or equal than the new LP value, we can just add and we have a solution with value less or equal than the one of the original LP respecting the degree bounds plus two. Otherwise, there is one node that has degree in the support. So, we just remove that degree bound on that vertex (i.e. remove from ), make (again,eliminate the edges not in the support) and run the algorithm again. Clearly, if one node is still in , it has , since there are only three edges in the support, there will be for the rest of the computation, just three edges incident to it, so there will be at most three edges more incident to it. So it will exceed its original by at most . Theorem 2 The algorithm described above produces a spanning tree of cost (the LP values and therefore )in which each node has degree . The first 3 items are straightfoward properties of basic solutions. The fourth one, means that for two sets , one of three things happen: , or . Now, we based on the previous lemma and in the following result that can be easily proved by induction, we will prove Lemma 1. Lemma 4 If is a laminar family over the set where each set contains at least elements, then . Now, the proof of Lemma 1 is easy. Let’s do it and then we come back to prove Lemma 3. Simply see that what contradicts . Proof: Let be any basic solution. It can be represented by a pair where and is a family of sets. We will show that the same basic solution can be represented by where is a laminar family and has the same size of . Let be all sets that are tight under and a maximal laminar family of tights sets in , such that are independent. I claim that . , then is in and intersects fewer sets of than , since all sets that intersect in must intersect as well (since no set can cross ). 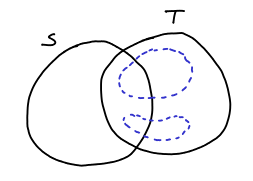 , then is in and intersects fewer sets of than , since all sets that intersect in must intersect . In either case we have a contradiction, so we proved that . So we can generate all the space of tight sets with a laminar family. And this finishes the proof. Let’s go over all that we’ve done: we started with an LP and we wanted to prove that the support of each solution was not too large. We wanted that because we wanted to prove that there was one node with degree one in the support or a node in with small ( ) degree. To prove that the degree of the support is small, we show that any basic solution has a representation in terms of a laminar family. Then we use the fact that laminar families can’t be very large families of sets. For that, we use the celebrated Uncrossing Lemma. Note: Most of this is based on my notes on David Williamson’s Approximation Algorithms class. I spent some time thinking about this algorithm and therefore I decided o post it here. Write the matrix in the basis of its eigenvectors, then we can write where is the diagonal matrix with the eigenvalues in the main diagonal. which has only one eigenvalue and the the eigenvectors are all of the form for . So, the dimension of the space spanned by the eigenvectors is , less than the dimension of the matrix. This never happens for symmetric matrices, and I guess after some time as a computer scientist, I got used to work only with symmetric matrices for almost everything I use: metrics, quadratic forms, correlation matrices, … but there is more out there then only symmetric matrices. The good news is that this proof is not hard to fix for the general case. First, it is easy to prove that for each root of the characteristic polynomial there is one eigenvector associated to it (just see that and therefore there must be , so if all the roots are distinct, then there is a basis of eigenvalues, and therefore the matrix is diagonalizable (notice that maybe we will need to use complex eigenvalues, but it is ok). The good thing is that a matrix having two identical eigenvalues is a “coincidence”. We can identify matrices with . The matrices with identical eigenvalues form a zero measure subset of , they are in fact the roots of a polynomial in . This polynomial is the resultant polynomial . Therefore, we proved Cayley-Hamilton theorem in the complement of a zero-measure set in . Since is a continuous function, it extends naturally to all matrices . We can also interpret that probabilistically: get a matrix where is taken uniformly at random from . Then has with probability all different eigenvalues. So, with probability . Now, just make . If block has size , then has multiplicity in and therefore and therefore, as we wanted to prove. It turned out not to be a very very short proof, but it is still short, since it uses mostly elementary stuff and the proof is really intuitive in some sense. I took some lessons from that: (i) first it reinforces my idea that, if I need to say something about a matrix, the first thing I do is to look at its eigenvectors decomposition. A lot of Linear Algebra problems are very simple when we consider things in the right basis. Normally the right basis is the eigenvector basis. (ii) not all matrices are diagonalizable. But in those cases, Jordan Canonical Form comes in our help and we can do almost the same as we did with eigenvalue decomposition.